The Machame Route now vies with the Marangu Route as the most popular trail. Machame is also the regarded by many guides as the most enjoyable, though it is longer and, according to most, more arduous. Despite this, the success rate on the Machame Route is higher than on the Marangu Route, possibly because the Machame is a day longer at six days and five nights (assuming you take the Barafu Route to the summit) which gives trekkers more time to acclimatize. An extra acclimatization day can – and usually is – taken in the Karanga Valley. The Machame Route also gives you the option of taking the Western Breach / Arrow Glacier Route to the summit. Where does the Machame Route go? It is not difficult to see why the Machame Route is so popular with everyone: beginning on the south-western side of the mountain, the trail passes through some of the mountain’s finest features, including the cloud forest of Kili’s southern slopes, the dry and dusty Shira Plateau and the delightful senecio-clad Barranco Campsite. To reach the actual summit you have a choice of two paths: most people head for the lengthy, long-winded climb up the Barafu trail, with the Rebmann Glacier edging into your field of vision on your left as dawn breaks behind Mawenzi on your right. Alternatively, the more adventurous can go on the Western Breach Route, departing from the regular trail at Lava Tower on the western side of Kibo before heading up to chilly Arrow Glacier Campsite, then pressing on from there to the crater floor, gaining access to the crater at a point near the Furtwangler Glacier. Many people will spend a night here at the Crater Campsite, before pushing on up the crater’s southern rim to Uhuru Peak. Unlike the Marangu Route, on the Machame Route you don’t use the same path to descend as you took to climb up the mountain, but instead you come down via the Mweka Route, a steep but very pretty descent encompassing inhospitably dry mountain desert and lush lowland forest in a matter of a few hours. Day 1 Moshi-Machame gate-Machame Hut/camp. The rout continues on up through the forest until we are at the steep ascent on the Shira Plateau,where there are rewarding views of the mountain. Looking back, you will see Mt.Meru rising high above Arusha town. We camp at Shira caves (3840m).We will have an evening walk of 100m high for altitude acclimatization(Walk high and sleep low). After breakfast we start a day by walking on high moorland, the landscape changes the entire character of the trek. We traverse the southwest side of Kilimanjaro, passing underneath the lava Tower and the final section of the Western Breach and finally reach camp at Barranco camp (3900m). The day has been spent at altitude (up to 4600m), but we have also followed the mountaineering code of ‘walk high, sleep low’ to avoid altitude sickness. 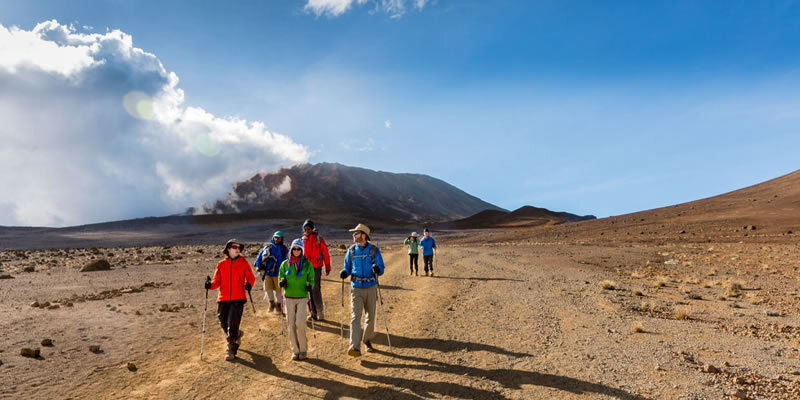 Leave slowly crossing the floor of the great Barranco Valley and up the Barranco wall; continue the trek on the South Circuit path through the Karanga Valley. Then slowly trek (7 hours) to Barafu Hut (4600m). From Barafu you will have excellent views of Kibo and Mawenzi peaks. Barafu Hut is situated on an exposed and dangerous ridge, so it is necessary to familiarise yourself with the terrain before dark. We will have our dinner, rest and prepare for summit night. We normally start our ascent by torchlight around midnight so that we can be up on the Crater rim by sunrise. The steeply climb over loose volcanic scree has some graded zigzags and a slow but steady pace will take us to Stella point (5735m. ), in about 5-6 hours. We will rest there for a short time to enjoy the sunrise over Mawenzi. After breakfast, finish the trek with a descent to Mweka Gate. Your last hike on Kilimanjaro is a beautiful one, passing through Kilimanjaro’s cloud forest. Watch your step during the descent, as the trail can be slippery. Our vehicles will be waiting at the lower station of Mweka Gate to take you back to Moshi.